New online booking special for 2017. That's Adults at Child rates! Our specialty!! Of the 150 plus tours we operate per year, the 1500+ passengers per year who travel with us, this is 80% of all our departures. 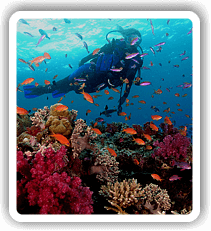 Both the Certified Diver and Snorkeling / Introductory Diver Trips are on the same vessel: S.V. 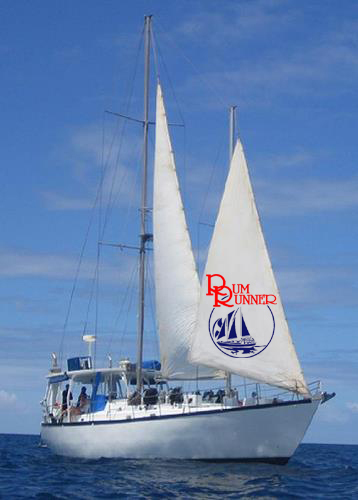 Rum Runner. 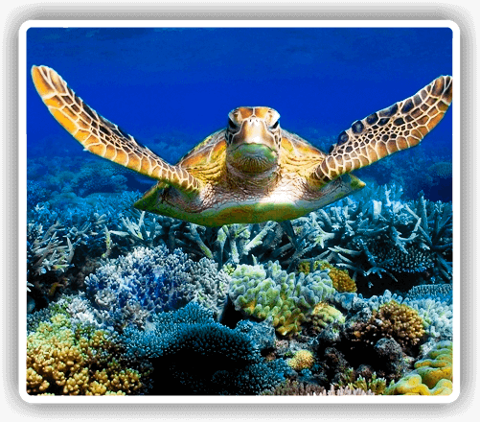 We average 50% Snorkelers and 50% Certified divers per trip. So bring the whole family. Day 1: Cairns to Outer Reef. Passengers meet at the company office (Rum Runner - Marlin Marina, E finger, Berth 3) by 7.00 am for an approximate 7.30 am departure. 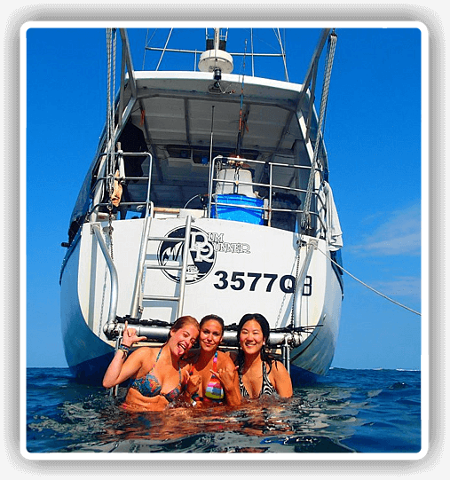 Passengers are briefed as to the itinerary and safety aspects of the trip and boat, and the equipment is organized, making it ready for your arrival at the Reef. Passengers are welcome to join in, grab a line and hoist a sail alongside the crew. From 11.00 am : Arrive at Thetford Reef. 4 dives and snorkeling sessions. Arriving at Thetford Reef the Dive Instructor will brief everyone on general dive safety and details of the first dive site. Snorkeling will be tailored to suit individual experience levels. If anyone is a bit rusty one of the crew will accompany him or her on their first snorkel if they wish. It is time for some of the best snorkeling in the world; Sites include The Labyrinth, the Lagoon, Hurricane Bay, Coral Gardens ; from shallow coral gardens, isolated pinnacles to caverns, swim through's and spectacular walls. Day 2 mornings: 2 dives and snorkel sessions are on offer. An invigorating morning dive and snorkel, before a hearty breakfast sees the start to a day of snorkeling & exploring. Last site includes swim-through's and caverns, then a quick lunch break before heading off before noon. The sandy floor from which the bommies rise, is home to garden eels and resting white tip reef sharks. Potato cod and turtles are on the menu especially in the shallower sections. There is also plenty to see in terms of macro life and around the reef. Crustaceans abound in this site which is 1 of several here that make great night dives. Cleaner shrimp, Saron shrimp and Bumble Bee squat lobsters are among the more interesting residents. Good visibility is common here making Turtle a favorite site for underwater photographers. Included: All bedding linen, All meals, Light refreshments provided after dives Coffee, tea, hot chocolate, Tap drinking water. extra inclusions: all snorkel gear and wet suits as required. WOW THAT'S 8 + hours to Snorkel during the trip.